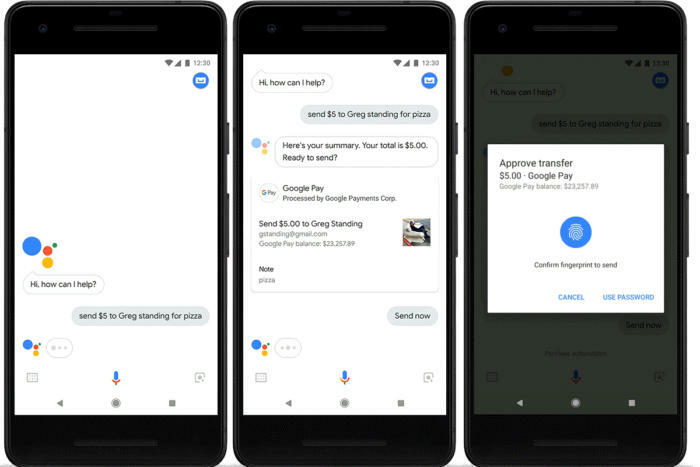 Google Pay integration with Assistant (Google's digital voice command) will now allow you to send and receive money from your contacts on Android and iOS smartphones, with support for smart home speakers coming in the near future. This is coming on the heels of Google Assistant-powered shopping initiative, Shopping Actions, which allow users to purchase items on Google search, the Google Express shopping service, and via Google Assistant. While Google opened up the Google Payment API to developers to enable an easy-to-use checkout experience powered by Google, with promised Assistant support, which perhaps is now fulfilled in this new function. Google Pay accounts will be required to initiate sending payment, and for those who don't have, they will be guided on how to set it up on the first time they ask the virtual assistant to send money. The voice commands follow the examples: "Hey Google, request $20 from Sam for the show tonight" or "Hey Google, send Jane $15 for lunch today." And to ensure optimum security, Google will require all transactions to be authorized by the users from their phone, through Google account password or fingerprint scanner on their device. It is pertinent to note that Google has already brought all its payment platforms: Android Pay and Google Wallet into Google Pay, and the integration with Google Assistant is perhaps one way Google intends to expand its ecosystem.